I had a few folks from work coming into town and a couple of them asked about the car; now that it was running well I thought it’d be a good opportunity to give a few people the rides they’ve asked for and to get some more break-in miles on it. 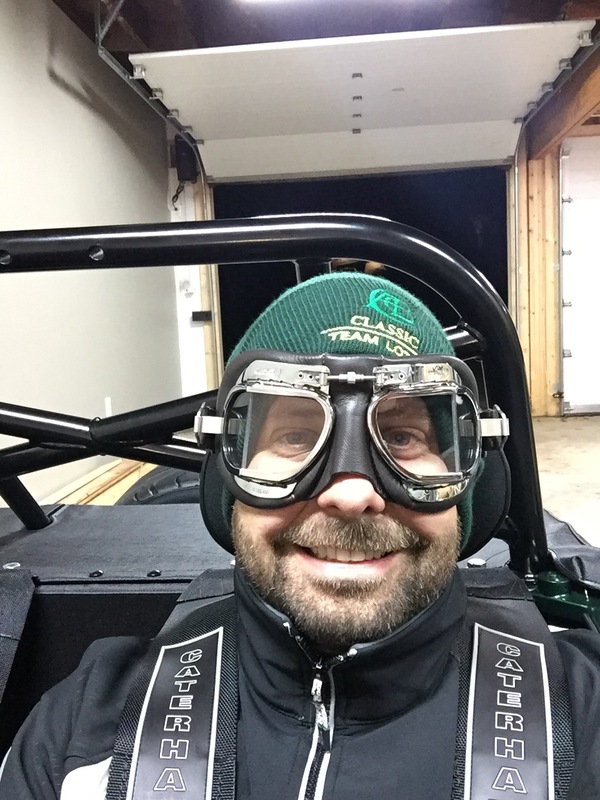 On a very, very cold morning – about 37 degrees (F) – I suited up with my new goggles, skull cap, and wind proof jacket and headed to work. The goggles are a set of Mark 49 Halcyon goggles I’d ordered a couple weeks ago. I’m happy to say they work great and would highly recommend them to other open top drivers. Fit and finish were excellent, no fogging, and come with interchangeable tinted lens (although I haven’t used them yet). They were incredibly comfortable and no complaints. It was a daily commute, about 35 miles in traffic, so not much to really report. The car seemed to run well (enough) although the first 20 minutes or so the idle was all kinds of weird. After that it seemed to settle down and idle high, in the 2000 RPM range. From conversations with James Gibson, my warranty contact at Caterham, I should be aiming for an idle at 950-1100 RPM. I’m much, much too high. The fuel gauge also started working on the way into the office which means the gauge plug is probably a little loose. At least it’s not something in the tank itself. Anyway, all the passengers loved the car and the experience. I made it roughly 100 miles with no major issues, although it was chilly there and back. The trip home was entirely in the dark which was a little disconcerting – you’re really small and cold in the dark. I was fairly comfortable most of the way home without the heater, but finally turned it on when I realized I was completely chilled. The net effect of that was a sweating, hot right shin, a freezing left leg, a chilled torso, and a warm face and head except for the tip of my nose which extends past the leather goggles. It makes for a humorous sight when you get home and start disrobing your layers; I’d make a reference to Rudolph but it’s not passed Thanksgiving so we can’t talk about Christmas yet. Hopefully the parts from Caterham will arrive over the Thanksgiving break so I can get some things squared away. The weather is supposed to be pretty mild, sunny in the high 50’s to low 60’s, excellent driving weather, and would really enjoy getting some miles in and troubleshooting done. Hope everyone has (had) a great Thanksgiving week!